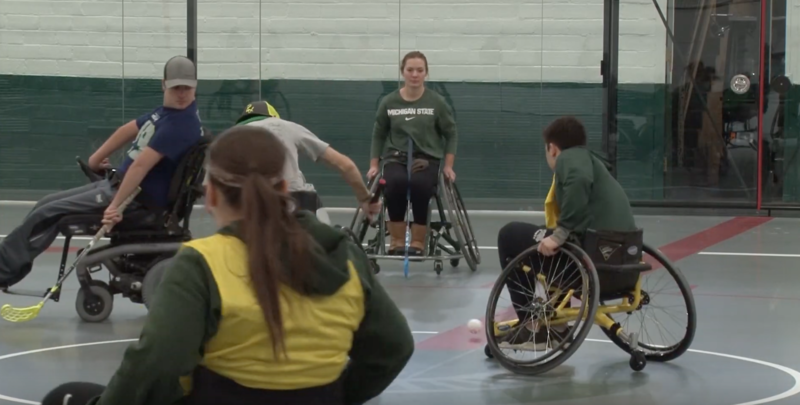 The MSU Adaptive Sports and Recreation Club is providing a way for those who are disabled to get active, have fun, and be apart of a great family. EAST LANSING, Mich. - Piotr Pasik, an instructor in Michigan State’s Kinesiology Department, wants all students to have an opportunity to play sports. So he started a program, called the Adaptive Sports and Recreation Club, in 2014. Members of the MSU Adaptive Sports and Recreation Club enjoy a game of wheelchair hockey. Pasik, who also is an MSU alum, saw a lack of physical activity opportunities for individuals with physical disabilities. His program offers a various number of sports and activities throughout different days of the week. WKAR Current Sports beat reporter Samantha Basirico tells us more about this program.